On Monday, I gave you a recap of the Spring Style Soiree hosted by ALIVE Magazine, St. Louis Fashion Week, and West County Center. I mentioned coming home with one top, and that would be this perfect peplum. I bought it from Altar'd State, which I had never heard of before that night. I was impressed by their runway presentation and was excited to see what else they had to offer. Apparently they have stores all across the midwest and southeast part of the country, so I'm a bit surprised I was completely in the dark. Yasmin, another local STL blogger, described it as an affordable option to Anthropologie because of their boho styling and clever home decor pieces. I can definitely see where she was coming from with that! I could have spent a lot more time in the store and know that I will be a repeat customer. For now, I was happy to add this peplum to my collection. If you follow me on Instagram, you saw the sneak peak I gave you of this top. Before I left for San Antonio, I could not resist styling it for a flat lay. I got all giddy when I realized how perfect my beaded necklace would look with it! I will have to wear the necklace with this top next time. Today, I decided to dust off my leopard pumps. I haven't worn them since my Remix challenge! You know it's bad when I shrug off leopard! But, I was craving them again, and lately I've been loving navy with leopard, so i was really excited to see today's outfit come together. And on a final note - I'm pretty sure anything + white skinnies = spring, amiright? This top is sooooo cute, I adore this look from head to toe and I want every single item. Awwww - obsessed with this top! I have not heard of that store either - but you know I'm heading to West County now! Such an adorable top!! And that bag..obsessed!! 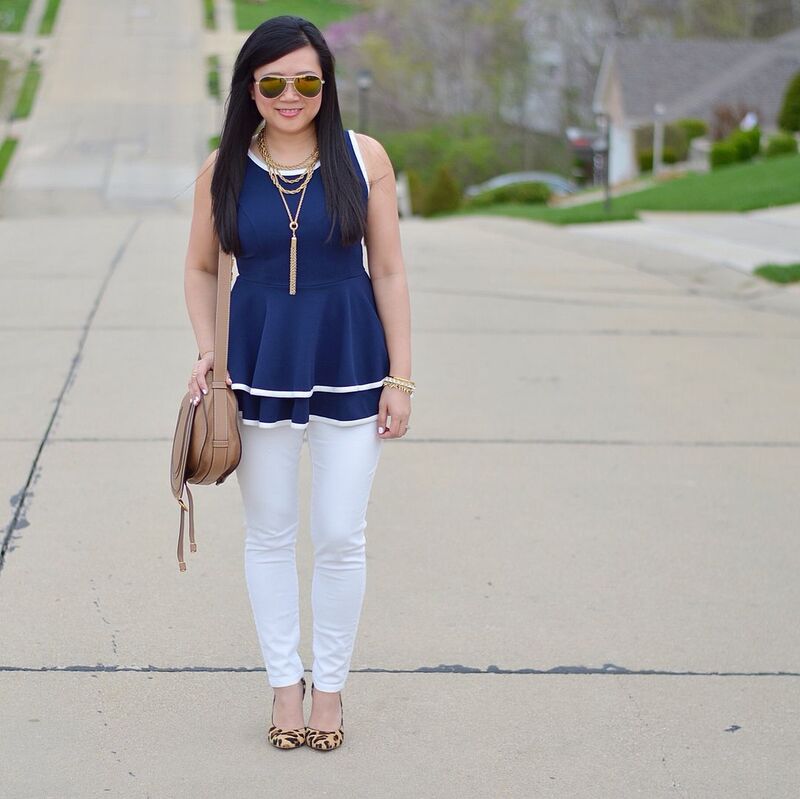 I seriously love that navy peplum top! It's so cute! 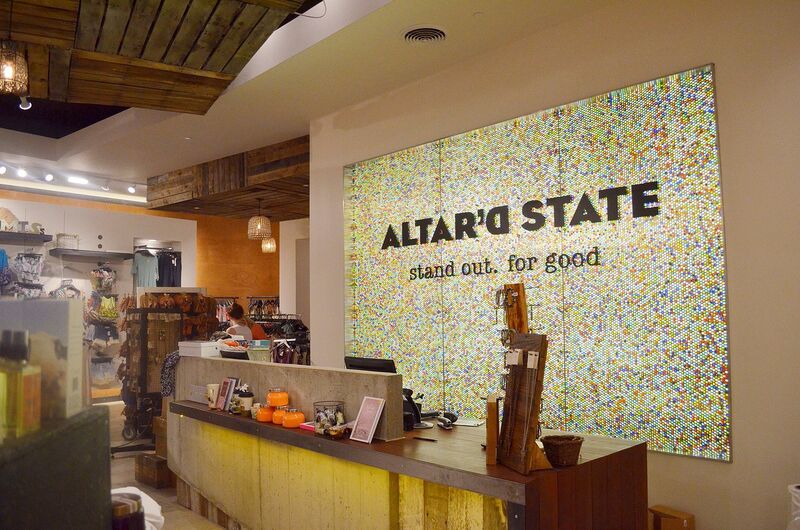 I've never heard of Altar'd State, I will have to see if there is one near me! This outfit is sooo perfect! It probably makes my top 5 of all time favorites of yours. Such a great top, perfect layered necklace, love the white skinnies and leopard pumps!! PERFECT. 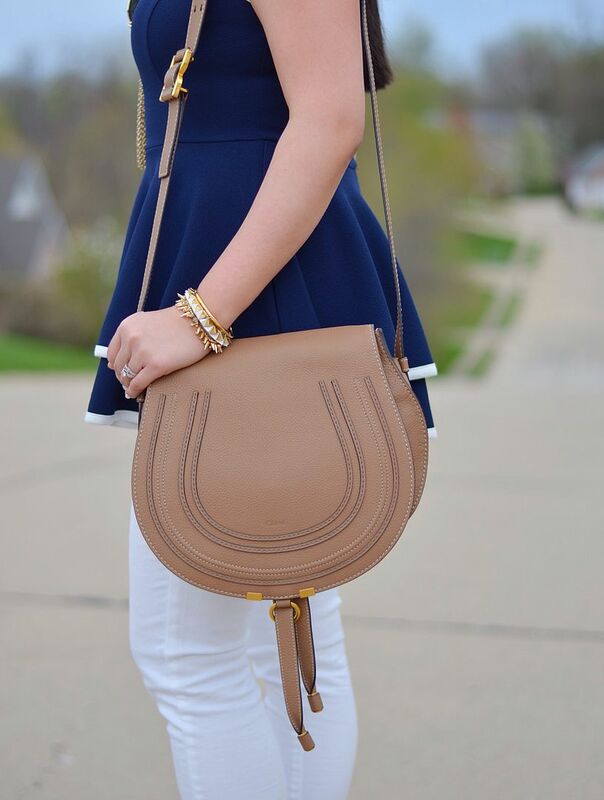 Fantastic peplum and I love that it's navy! I've been craving more peplums lately as I only have one (that I can think of). There's that mint beaded necklace again...I love that thing!! I saw a similar one recently somewhere and thought at the time "nah, I don't need that", but seeing it here again, I may retract that statement...I need to remember where I saw it now, lol!! I'll have to look and see if there are any Alter'd stores here...like you, I've not heard of it before. I haven't heard of them either but they are opening a store in my favorite mall (yeah, the one an hour and a half away) so I will check it out! I love that fun top with those leopard heels! That top is so cute and girly and I love its nautical feel. Great shoes and bag, too. This whole outfit is so classy and fun. I love love love that top with the gold necklaces. 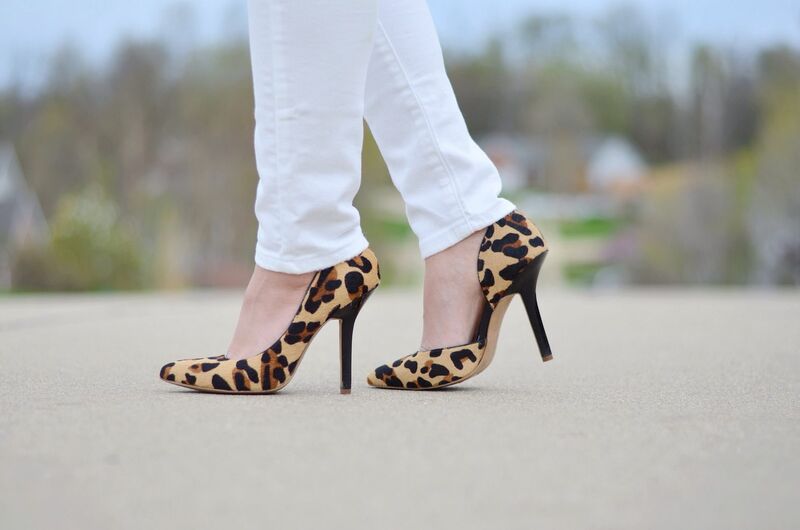 And the leopard heels are incredible! I've never heard of this brand either - this top is so pretty. I love the nautical vibe of it.